Not every Masdevallia needs a cool greenhouse. This beauty shrugged off two exceptionally hot summers and rewarded us in early autumn with a microburst of flowers. 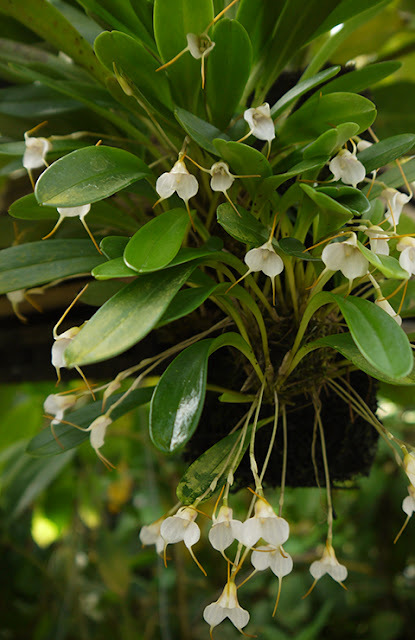 There are a handful of Masdevallia species that are warm growers, i. e., they tolerate daytime temperatures pushing 80 degrees, Masdevallia floribunda being one of them. A hybrid with M. floribunda in its parentage can be expected to have some degree of warmth tolerance. All right. Enough recitative. Want proof that Masdevallias are some of the most beautiful orchids on earth? 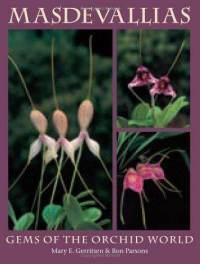 Check out Gerritson & Parson's book, Masdevallias, Gems of the Orchid World. This is a dangerous book. I'm not generally susceptible to plant lu$t (really), but I have to admit that Masdevallias get to me. And prolonged exposure to the photographs in this book makes me dizzy. Not that I want to buy all the species pictured. I just want to be around them all the time, like some sick groupie. Sell my house and move to Cuenca, Ecuador. Visit Ecuagenera every day. Okay, enough. Close the book. 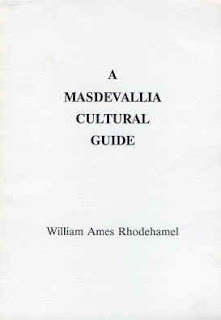 If you are susceptible to this sort of thing you might be better off with Will Rhodehamel's Masdevallia Cultural Guide, which has no photographs, just the facts in plain jargon-free English. Confused about the exact meaning of "warm, intermediate and cool-growing"? Here it is. Want to know exactly how much light and humidity you need? Rhodehamel tells you. And look how plain the cover is. You can keep your house! A great guide.